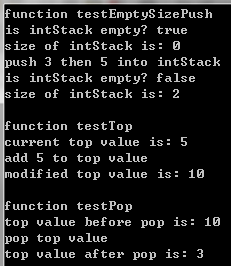 /** Test basic operations of stack. *        only from the end of the container. *        top of the stack. *        Returns whether the stack is empty, i.e. whether its size is 0. *        Returns the number of elements in the stack. *        Adds a new element at the top of the stack, above its current top element. *        The content of this new element is initialized to a copy of x. *        Removes the element on top of the stack, effectively reducing its size by one. *        The value of this element can be retrieved before being popped by calling member stack::top. *        containers this is also the last element pushed into the stack.